Palestine activists will highlight the BBC’s pro-Israel bias in an annual protest against the occupation of Jerusalem, which coincides with the first anniversary of the Gaza War. Activists marched from the BBC’s Broadcasting House at Portland Place to the US Embassy in Grosvenor Square as part of Al Quds Day demonstrations, held annually on the last Friday of Ramadan. Al Quds Day rallies take place across the globe, but are especially prominent in the Arab world where they can receive state support. Speaking to RT, IHRC Communications chief Nadia Rasheed said the BBC was chosen as a starting point of the march because of its “pro-Israeli” bias. “We’re starting near the BBC in protest of what we deem to be the bias in their reporting of the situation in Palestine and their pretense of impartiality when in reality their coverage is pro-Israeli,” Rasheed said. In a press release, IHRC said the US Embassy in London was chosen as the rallying point because of Washington’s continued support for Israel. “The scale of US support is unlike any given by any country to another nation. Since 1948, the US has used its UN Security Council veto at least 40 times to block condemnation of Israel. Every day Israel receives $8.5 million in military aid from its patron and in total each US citizen subsidizes every single Israeli citizen to the tune of $500 per day." Friday’s rally also marked the one year anniversary of the 2014 Gaza conflict which saw the deaths of 2,250 Palestinians and 72 Israelis. IHRC said the effects of the invasion continues to scar the “landscape and inhabitants” of Gaza, with many suffering from psychological trauma while also being forced to live in temporary shelters. 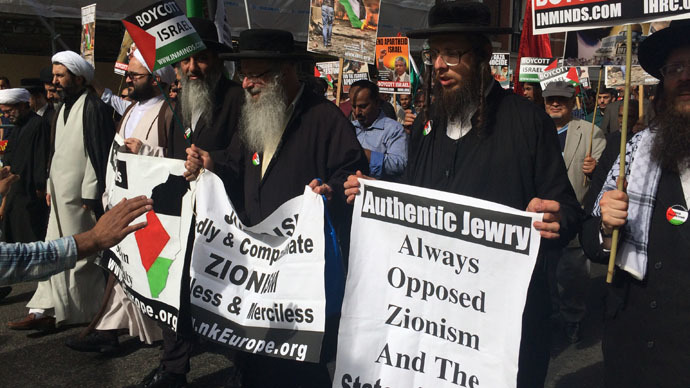 The first Al Quds Day rally was held by Iran in 1979 – immediately following the country’s Islamic revolution – to protest Israel’s occupation of East Jerusalem, oppose Zionism and express support for Palestinians. Al Quds is the Arabic name for Jerusalem, a city which both Palestine and Israel claim as their capital. Israel occupied West Jerusalem following the 1948 Arab-Israeli War and annexed East Jerusalem after the 1967 Six-Day War against Jordan. Iran’s annual Al Quds Day rally also took place on Friday and saw tens of thousands of protestors chant “Down with America” and “Death to Israel,” according to the Associated Press. IHRC’s Al Quds Day protest began at 15:30 BST at Duchess Street, London outside BBC Broadcasting House.